This guidebook entry was created by Shawn Wilson. HISTORY: The area was home to the Beckwourth Trail, a trail made by James Beckwourth over the mountains for early settlers to cross to the Sacramento Valley. It was first used in 1851 and continued to be used up until 1855 when the railroad supplanted it. The Spanish Peak and Meadow Valley areas were once a heavily mined. The scars from old hydraulic mines near Meadow Valley can still be seen from the top of Spanish Peak. The tailings still fill Spanish Creek in many places as well. DESCRIPTION: Spanish Peak sits atop a granite basin which holds several small lakes including Gold Lake and Silver Lake. The peak itself is situated within Bucks Lake Wilderness. 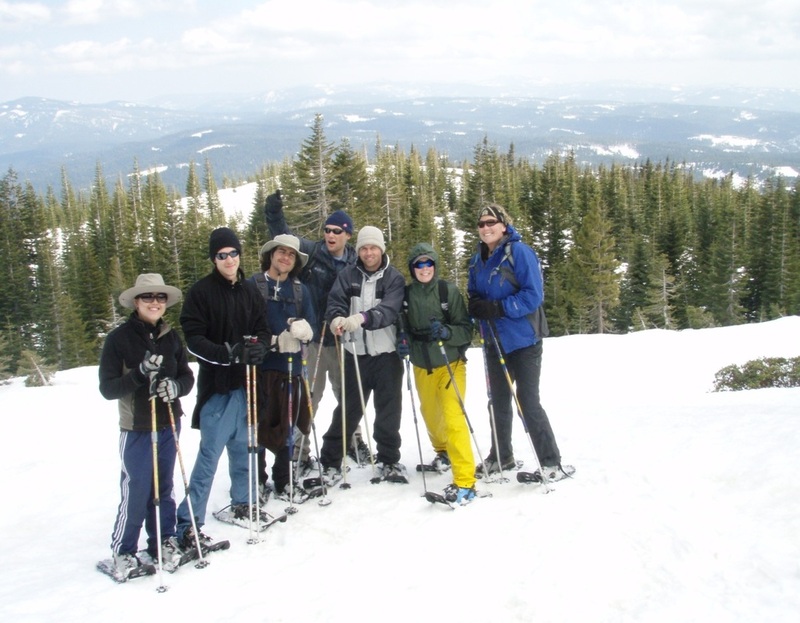 A number of trails run through the area including the Pacific Crest Trail (PCT). The abundance of granite in the area provides great opportunities for rock climbing. DIRECTIONS: From Quincy, head west on Bucks Lake Road. Just past the small community of Meadow Valley, a dirt road heads north toward Silver Lake. It is labeled by a small sign indicating the miles to Silver Lake. Follow this road to Silver Lake. The road can present interesting obstacles for cars with little clearance but most vehicles can make it to Silver Lake with little trouble. TIME NEEDED: Climbing Spanish Peak can be done in an afternoon, but is far more enjoyable when a whole day is reserved to do it. SUN EXPOSURE: The Gold Lake area gets plenty of sun most of the day, but the sun sets behind the ridge early so be prepared for cool evenings. ELEVATION: Spanish Peak is 6,975 ft.
BEST TIMES: Spanish Peak can be done any time of the year, however the route given here is a fair weather route; it does not take snow into consideration. RATING: I rank this hike at a 4 because of its great views. THE HIKE: There are many ways to reach the top of Spanish Peak. I highly encourage finding a unique way up to the top as it will make for a great adventure. The peak and the surrounding areas are very interesting, and the Gold Lake area is always a cool spot to scramble around amongst the granite. I present here my favorite way to get to the top. Once you are parked, head across Silver Lake’s dam. Right after the dam there is a fork in the trail. Stay to the left (the right fork leads around the edge of Silver Lake). The trail will head up and away from Silver Lake. Follow this to another fork marked by a 4x4 post. Again, stay to the left. This trail will lead you to Gold Lake. At Gold Lake, you can look up and see the northern tip of Spanish Peak. Here the trail ends and the cross country part of this hike begins. This is also the last place to get water, so tank up if you are running low. Walk to the southern edge of the lake and begin working up a talus slope toward the tree-line above. It is a fun combination of rock hopping and scrambling to reach the tree-line. If you are with a group or there are other people below you, be careful of rock-fall. Once at the top, follow the edge of the trees to the nondescript tip of the peak. A concrete slab lies at the top, all that remains of the lookout. Write a comment in the register and admire the views. Once again, there are many ways back down. Simply to see more country, I prefer to head east on a trail from the peak. This trail connects with the PCT. Head north through old stands of Red Fir along the PCT until you reach the junction with the Granite Gap Trail. This trail can sometimes be hard to spot so keep a lookout for it as it heads down to your right. Due to its infrequent use, it can be hard to follow but the basic idea is to head back down through the granite to Gold Lake. Once there, follow your steps back to the trailhead. 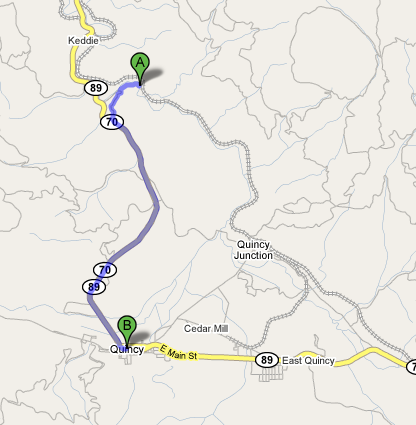 DRIVING DIRECTIONS: Leave Quincy on highway 70 West towards Oroville, Drive 5 miles to old Highway. Take a right on old highway and fall down to Spanish Creek. Fallow dirt road next to Spanish creek, Park at the end of the road. THE CASCADES TRAIL: It is an easy walk to a beautiful swimming hole and small waterfall. Very accessible for anyone who enjoys a quick and easy hike. I would rate the Cascades 3 stars. TIME NEEDED: 20 minutes of hiking. SUN EXPOSURE: You will find most of the sun in the middle of the day. GEAR NEEDED: Light hiking shoes. HIKING DIRECTIONS: Once you park you will find a trail leading up the creek. Follow this trail for 1 mile until you reach the Cascades. This guidebook entry was created by Dan Rice. DESCRIPTION: The Cinder Cone National Monument extended from Butte Lake in north to Snag Lake in the south and encompassed all of Cinder Cone and the area now known as Fantastic Lava Beds – approximately eight square miles. This volcanic formation is dated around 800 years old and is one of the wonders of the park. The snag lake cinder cone lope is a great mellow multi day backpacking trip. Filled with a verity of scenery. Sub alpine conifer forests, mountain lakes, to dry desert like conditions near the cinder cone. The trail is moderate with a few climbs a couple of hindered feet in elevation. There are bear, deer, hawks and all sorts of other wild life some might be lucky enough to see. GENERAL INFORMATION: located in northeastern California at Lassen national park. From parking lot proceed to the west down dirt road; trial will be on the right. Proceed north along trail. Trail is well mark with sings and worn from travelers. 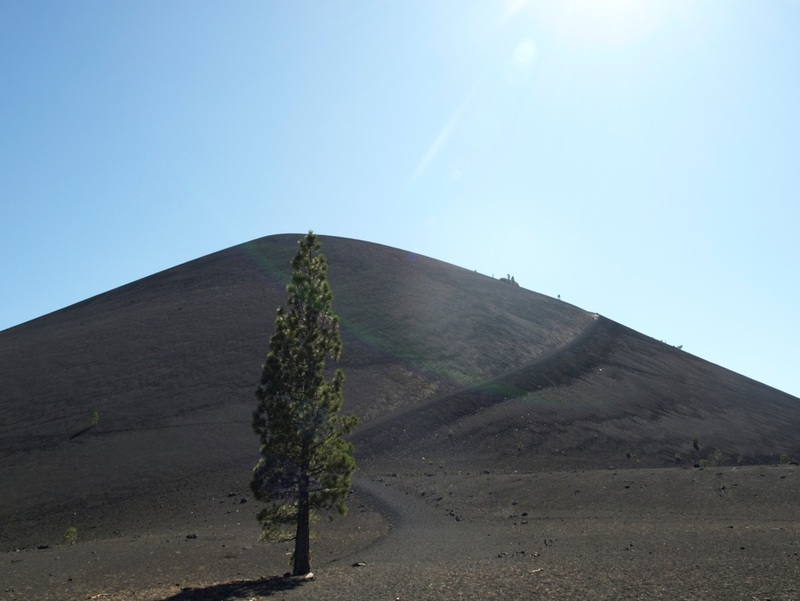 From Juniper Lake to cinder cone is aproxamently 8 miles one way. GEAR NEEDED: basic hiking or backpacking gear. I do recommend bringing along an extra water container. NOTES: well worth all the effort, scenery is asome. FACILITIES: Chester offers lodging, restaurants and gasoline. This guidebook entry was created by Chris Walls. HISTORY: Devil’s Kitchen is Lassen County’s second largest hydrothermal areas in Lassen National Park located 7 miles southeast of Mt. Lassen Peak in the Warner valley region. Devils Kitchen is one of many geothermal areas located at Mount Lassen. 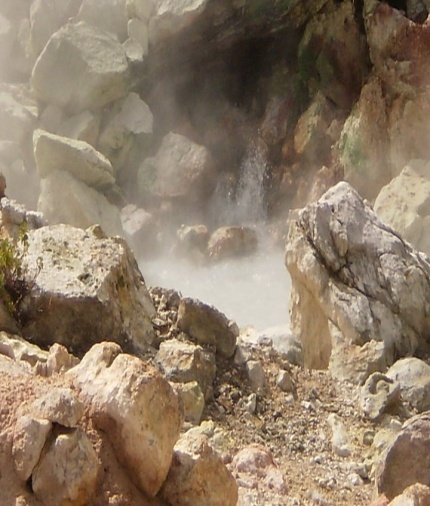 The origin of Lassen’s hydrothermal system has three required elements- abundant ground water, permeable rock, and a heat source of magma located at a depth of 5 to 6 miles under Lassen peak. DESCRIPTIONS: Leading into Devils Kitchen is a peaceful hike over creeks, hot springs, a beautiful wide open meadow and up and over through a thicket of trees opening up to a bowl of geothermal activity made up of boiling mud pots, stem vents, and boiling springs. DIRECTIONS: From Quincy, head West on Hwy 70 towards Chico for 10 miles, turn right on Hwy 89 towards Greenville for 31 miles, turn right on Hwy 36 for 2 miles into Chester, turn left on to Feather River Drive, left on to Warner Valley Rd towards Drakesbad for 15 miles. The trails head will be about 0.5 miles after Warner Valley camp ground both are located on left hand side of the road. This road is not recommended for RV’s and vehicles hauling heavy trailers. The road closes, during the winter months. DIRECTIONS: This trail is pretty easy to navigate through because it has plenty of markers set out on the trails pointing you in the direction of travel, along with your point of interest, and the distance to your point of interest. DESCRIPTION: The Warner Valley trail that leads you up to Devil’s Kitchen is well maintained trail. Starting at the trail head you will walk over several foot bridges through a wet marsh land to a bridge where you will cross Hot Springs Creek. Follow the trail up along Hot Springs Creek (Hot Springs Creek is not actually” hot”) where you will come to your first evidence of geothermal activity that being a small hot spring seeping out from the ground. As you continue up the trail a little further you will come to your first fork, stay to your right “remember these trails a well marked” continue a little further to another fork once again staying to your right cross the bridge one more time back over Hot Springs Creek, walk further over several long foot bridges through another wet marsh, as it opens up into a large beautiful meadow with breath taking views of the tall pines, and hills to both sides and also ahead of you, where you will gently ascend in elevation crossing one last fork staying to the right once again. As you continue up the trail you will do 3 to 4 gentle accents and descents crossing two more small streams before you smell the strong odor of sulfur that heavily fills the air with you final accent which is your steepest the forest opens and surrounds a large bowl known as Devil’s Kitchen. This guidebook entry was created by Owen Donnell. This trail offers brilliant scenery and access to three natural, glacier-fed alpine lakes up on Keddie Ridge just within the border of Lassen County. The closest town is Greenville in the Indian Valley and is a well-known local summer destination for hiking, swimming, camping, and fishing. It is located on Keddie Ridge in the secluded area known as Mountain Meadows just north of Greenville and south of Westwood. This area is sacred to the Mountain Maidu people who are native to this region. Mountain Meadows is the location of the birth of the Mountain Maidu people in their creation stories. The area is also important to the Mountain Maidu people for collection of important medicinal plants and spiritual guidance. 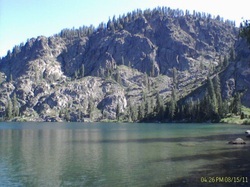 Mountain Maidu people have claimed seeing visions and communicating with spirits upon diving in Homer Lake and the whole area has traditionally been regarded as highly spiritual and powerful. DIRECTIONS: Take CA-70 W CA-89 North from town past Keddie, Butterfly Valley Road, and along Spanish Creek. After 10.1 miles, take a right at the “Y” where CA-89 splits off from CA-70. Continue North on CA-89, along Indian Creek and up into the Indian Valley and through Crescent Mills. Eleven miles past the “Y” of CA-70 and CA-89 you will roll through Greenville. A notable fact is that immediately north of Greenville you will be driving on the world’s longest continuous turn in a road. Wow. The turn off the HI way is Old Haun Road, 2.6 miles north of Greenville on CA-89. It is a dirt road, and unmarked, so it can be difficult to detect, but it is the only road north of Greenville that crosses the HI way (If drive underneath a concrete railroad bridge, then you are on your way to Canyon Dam and you’ve gone too far). You take a right up Old Haun Road. This is where it gets a little bumpy because the road is fairly rough. You take this road high up onto the Greenville Saddle, which offers some glorious views of the Indian Valley. You will drive 1.9 miles, where you will come to an intersection and make a right. Then take a left after 5.1 miles, and then another left turn 3.1 miles after that. Another 2.1 miles and you arrive at the trailhead! RATING: A good workout, but not especially difficult. Your Grandma could do it! GEAR NEEDED: Good boots/shoes, visor/brim hat or sunscreen, USGS 7 ½ minute map of the Greenville Quadrangle and compass, couple liters of water. DIRECTIONS: When you arrive at the trailhead there are actually two trails you can take to Homer Lake. As you pull up to the parking area at the trailhead, the trail you will see on the left goes up and over a hill and drops back down to the lake. It is a pretty long uphill stretch, and a steep drop back down. This trail can be fun, but I usually rather prefer the trail on the right, which will be right ahead of you as you pull into the parking area. This trail is a steady traverse and slight downhill for most of the way, but then a fairly steep climb right before the lake (definitely less strenuous than the trail to the left). Homer is a very scenic spot, and enough of a destination in its own right, with stunning rock formations and colorful displays of wildflowers in the summer. The lake has been seeded with fish (trout) that can be caught as well. The trail continues to Dearheart Lake from the very northern tip of Homer, where a creek flows from the lake. The trail ascends and descends through the forest a little ways before breaking out into a stretch of exposed rocky terrain where the trail crosses over a small cascading creek. Shortly after the creek you may notice a trail to the left going up a steep hill. This is the trail to Hidden Lake. The trail to Hidden Lake is pretty hard work, but I think it’s worth the effort. It’s a lot like Homer, but smaller. The surrounding rock formations offer some excellent expansive views of Mountain Meadows Reservoir, Westwood, Mt. Lassen, and other surrounding mountains. I’ve heard people say there’s no fish in this lake, but I swear I’ve seen some. Continuing on the trail to Dearheart Lake, after you pass the trail that goes up to Hidden Lake you follow the trail through some high brush until you come back into the forest. This is where it is a good idea to have a topographic map and compass, because the trail is not particularly well distinguished and can be easy to lose, but it basically just continues northeast climbing slightly and steadily until it drops down into Dearheart Lake. Dearheart Lake is smaller than Homer, but very nice, very scenic and good for fishing as well. RISKS: the Keddie Ridge area is known to have a sizeable bear population. Take bear precautions, if camping. Be aware of rattlesnakes, especially in rocky areas. Make sure to pack plenty of water on a hot day to avoid dehydration. Make sure to take that topographic map and compass! Please help to keep this special area clean and beautiful! This guidebook entry was created by Hunter Hedman. The Pacific Crest Trail route was first explored in the late 1930s by teams of young men from the YMCA. Once proven feasible, trail pioneers Clinton Clarke and Warren Rogers lobbied the federal government to secure a border-to-border trail corridor. 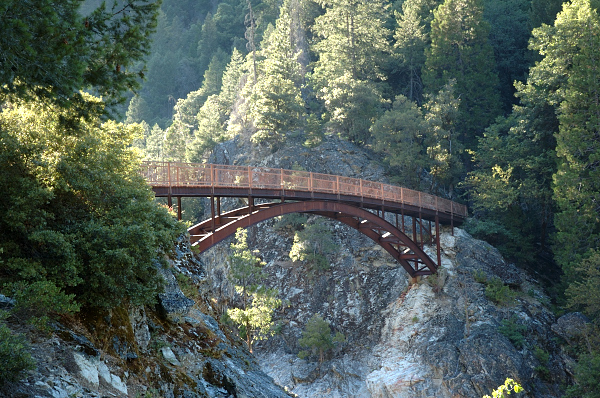 This trail combined with the Wild and Scenic Middle Feather river make for a great day out. The Middle Feather was designated wild and Scenic on October 2nd, 1968. The Middle Fork of the Feather River was one of the first nationally designated wild and scenic rivers. The river runs from it headwaters near Beckwourth, California, to Lake Oroville. This is one of the most beautiful parts of the Plumas National Forest and an area that is very seldom visited due to its remoteness and extremely rugged terrain. Old growth Douglass Fir and dense stands of Red Fir cover the hill sides while brush and Oak become more prevalent as you make your decent into the canyon. The river gradient varies from gentle at the upper end to very steep in the deep canyons of the lower reaches. The adjacent lands range from the most primitive imaginable to manicured golf courses and residential area. Access is good by oiled roads in the upper portion and is nonexistent mile after mile in the wild river zones. From Quincy, CA you will drive east on Bucks Lake road towards Meadow Valley. Continue through Meadow valley to Big Creek road on the left. Turn left on Big Creek road. Stay on Big Creek for about three miles until you see you see Forest Service road 22N28 on the left. Turn here and stay right where the road Y’s. This is where it gets tricky. Stay on 22N28 until you reach the 24N64 on the right, it is not signed but there is a pine tree with plastic wrap around it just before the turn. Do NOT turn till you reach this road. Take 24N64 down an extremely steep ridge until it Y’s again at a flat landing. Do not drive any further; this is where the hike starts. Allow yourself at least 5 hours from the trail head so that you may fully enjoy the area. Sun exposure is limited to a few hours mid-day due to the steepness of the canyon walls. Elevation begins at 4800 feet and ends at 3100 feet. The hike itself is not difficult but the drive to the trail head is extremely steep with large rocks and loose dirt. You should be very comfortable driving off road. Once the ignition is off look to the east and you will see a small wooden sign that says Middle Feather 1 mile. The trail is just to the left of this sign. As you hike the trail will begin to decline rapidly but never reaches more than a 15% slope. You will navigate several switch backs as the trail nears the river. Don’t forget to stop and enjoy the view. Before long you will reach the Bridge over the Middle Feather. From the bridge you can look up and down the canyon and possibly spot a trout in the pool below. This trip requires a good clearance four wheel drive vehicle, hiking boots, water and a thirst for adventure! This drive and hike offer a rare opportunity to experience on of the few untouched rivers in California. There is no water along the hike until you reach the river so be sure to bring at least a quart. The map to use is the Dog Wood Peak Topographic map. Maps can be purchased at the USFS supervisor’s office in down town Quincy. Caution should be used on this hike as the trail shoulders are loose dirt and rock. Rattle snakes are common in the area as is poison oak. Be aware of where you are putting your hands and feet. Enjoy this trip!